Campaigners fighting to stop their village bus from the axe given a boost. 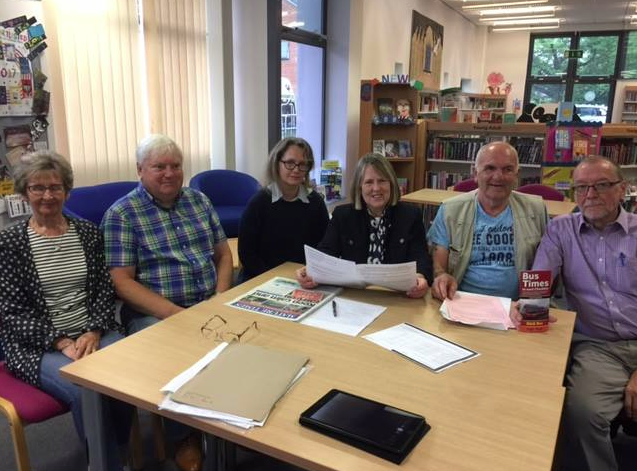 A deputation from Goostrey, Twemlow and Holmes Chapel parish councils were assured by Congleton MP Fiona Bruce they had her full support in efforts to save the 319 service. The circular route from Sandbach to Goostrey via Brereton, Holmes Chapel, Cranage and Twemlow will be withdrawn next year by Cheshire East Council unless a public consultation currently taking place to stop the closure is successful. The council is looking at all services in the area to prune £1.6m from its financial support for public transport. It will still have to find over £2m a year if the proposed cuts are approved. But villagers say stopping the 319 will leave pensioners, young people and others without access to transport, isolated and stranded and virtually impossible to get to shops or for medical appointments. A suggested dial a ride service has been rejected as a substitute for the regular service operating from shortly 9 am until early afternoon six days a week. After the councillors meeting with the MP at Holmes Chapel Library, one regular user said: “We are delighted she feels that we have a very good case to keep the service running and is supporting our efforts to stop the closure.For many people, it is not only a vital link with the outside world but they would barely have any social contact at all without it.” Local councillors are also concerned about plans to reduce the 42 service from Congleton to Crewe via Holmes Chapel, Middlewich and Leighton Hospital. She continued “I have had residents not only from the Goostrey, Twemlow and Holmes Chapel Parish Councils contact me with their concerns about these proposals but also constituents from elsewhere in the Congleton Constituency – particularly rural and semi-rural areas such as Rode Heath and Scholar Green. It is not only the older constituents who would be affected – many young people don’t drive – and not everyone can afford a car. I am told that the alternative proposed – called the ‘Little Bus’ in the Council’s consultation document, but perhaps better known as ‘Dial-a-Ride’, would not work, being limited both in routes and on which days it operates, and requiring prior booking which is not always possible – for example, for the same day or next day surgery appointment. As one resident told me ‘this will take my independence away’. Fiona urged all concerned residents to contribute to the consultation which closes on July 26 and which can be found at www.cheshireeast.gov.uk/busreview or by calling or visiting their local library.